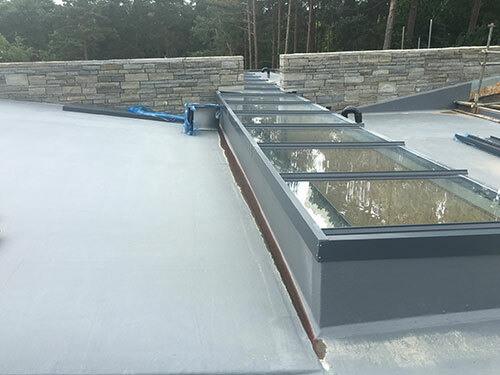 UK Roofing is based in Weybridge, Surrey and we are a specialist Fibre Glass Flat Roofing company. Our fibre glass roofing work is carried out to a very high standard. We have over 20 successful years in the industry, covering thousands of square metres of high performance seamless flexible glass fibre flat roofing. All our work is carried out by our very own, fully trained tradesmen who are put through a 2 year training period, thus ensuring the highest standards of workmanship and customer satisfaction. UK ROOFING IS NOT A FRANCHISE AND NONE OF OUR ROOFING IS CONTRACTED OUT TO OTHER COMPANIES. WE PROVIDE A TOTAL SERVICE FROM START TO FINISH FOR OUR CLIENTS. UK Roofing systems are fully insured and all our work is guaranteed for 30 years. This provides a strong cost effective and tidy finish to any flat roof or valley. Our fibre glass system is perfect for balcony surfaces, with a wide choice of colours and an anti-slip surface if requested. Our Glass Reinforced Polyester (GRP) roofing system is designed to out perform any traditional methods of flat roofing by many years. It has a life expectancy of 30 to 35 years. This is the only true cost effective solution around for flat roofs. Only UK Roofing can provide a high quality, guaranteed, weatherproof, maintenance free flat roof solution.